PALM DESERT, Calif. - A wide variety of trees and plant life scatter across the Classic Club, from olive and California Pepper to a smattering of pines. Take in the views at Classic Club, which is void of nearby residential developments. On the Classic Club's scenic landscape, golfers will find a wide variety of trees including olive trees, towering pines, and California pepper, but unlike the many other golf courses in Palm Springs, there isn't a single palm tree. But no palm trees. Surprised? That's exactly the point. Palm Springs anchors roughly 125 golf courses in the Coachella Valley, and you're hard pressed to find many void of the signature palms. "The novelty of the Classic Club is that when you're playing, it looks like it could be placed essentially anywhere," said Brady Wilson, director of golf at Classic Club. "If you put this course in the Midwest, it could host a U.S. Open." High praise for a golf course that lost its spot in the Bob Hope Classic rotation in 2008. The fact remains, though, that it features all the shot values of a tour-worthy venue, stretches to 7,322 yards and boasts a 75.8/144 slope/rating. Some pros griped about Classic Club during its short stay in the Hope rotation, but traveling golfers shouldn't much consider the tastes of the professionals. In fact, there's never been a better time to play it after management reduced peak-season green fees more than 30 percent to $125. It's the rare valley golf course with no attached housing element. Classic Club features 240 acres of maintained turf with no real estate anywhere, presenting a look as unique as you'll find in Palm Desert. Its setting might lead you to believe Classic Club ranks among the area's most expensive or even private golf courses, but its does not. The Berger Foundation owns Classic Club, designated as a charitable golf course - the first of its kind in the United States. Palm Desert residents receive discounted rates, even in peak season. But the golf course is no simple tax write-off. The owners entrusted Troon Golf to manage the facility and keep conditions tour-ready during the peak-season spring months. As a result, the desert southwest offers no better grounds than here. The golf course opened to high acclaim, rating among the top-five best new courses in 2006 by Golfweek. Thirteen holes were altered in 2007 after the first Hope event. It can play as tough as you want, with brawny par 3s and 4s from the championship tees. But like any good golf venue, it includes par 5s on which it's worth taking aim in two and short par 4s to help round out the scorecard. Two par 3s, the sixth and 17th, offer left and right tee-box locations to present entirely different shots into the green. The back nine begins a stretch of golf considered by the staff as Classic Club's rendition of "Amen Corner." Water covers the right side of No. 10, a tight driving hole, and more of it protects an elevated green with a rock wall short and to the right. No. 11, tricky as well, requires a shot over water, and No. 12, short at 162 yards, again plays over water and a bunker guards the green. The par-5 18th, especially with a little wind at your back, provides the opportunity to go out with a birdie or better if you brave an approach shot over a large pond. With green fees cut during the peak season from $190 to $125 and tour-caliber conditions, Classic Club presents value and quality. And despite its $45 rate for locals, the golf course has all the makings of a tour venue: A stately clubhouse facility with dining and locker rooms, valet parking and a full practice range. The secret is out about Classic Club, so reservations are strongly recommended. Be sure to call early to book your time, because locals receive the preferred rate starting three days in advance. Indian Wells serves as a good base for your Palm Springs golf trip. 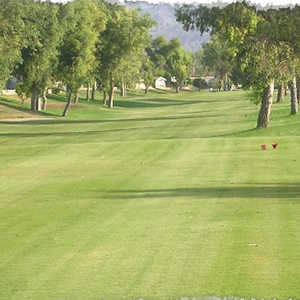 Located between Palm Desert and La Quinta, Indian Wells provides access to scores of golf courses. The Hyatt Grand Champions, one of four resorts in Indian Wells, sits within walking distance to the IW Club, home to the Players and Champions golf courses. The Hyatt also offers discounted, stay-and-play packages. The resort's 45 acres includes a spa, seven pools and lodging options from single rooms and suites with private balconies in the main hotel to luxury villas that offer private spas and butler service.